Where’s The Real Estate Party With The “Sold” Presents? Having a real estate listing expire it’s listing contract without being sold is a little like giving a party with no food, music or presents. Inviting all of your friends to come and celebrate with you but then telling them to come back later for the real fun. 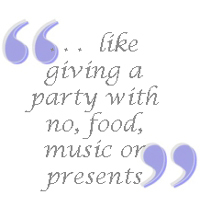 Everyone arrives at the party with great anticipation of enjoying the company of the guests, good conversation, food and music only to have the host announce, “please come back next month when we will have the “real party” with the decorations, the food, drinks, dancing and presents! Would you go back? Probably not. But it happens every day in my real estate market of the Chester County Pennsylvania Main Line area when listings expire without selling. And it’s mostly avoidable. A listing that expires it’s listing contract unsold is an enormously painful event for both the Seller and the Listing Agent. The number of expired listings is growing. So what can be done? Why Do Listings Expire The Property Listing Contract Unsold? Which of the 4 Selling Factors does the Seller control in the Listing? Which of the 4 real estate sold factors, Price, Location, Condition or Marketing does the Realtor® control? An honest, thorough, written Comparative Market Analysis (CMA), including a pricing strategy and thorough market data to support the pricing strategy plus the design and implementation of an aggressive Real Estate Property Marketing Plan is the responsibility of the Realtor. Is your listing currently expired? Is it time for a fresh approach? Share your story if you like or call Judy with any questions, 610-889-5509 you have about the process of selling real estate in today’s market. Come join the party. The one with the presents. Do You Know The 2 Words To Get Your House Sold? This entry was posted on Monday, October 13th, 2008 at 7:15 am	and is filed under Expired Listings Help, Home Sellers. You can follow any responses to this entry through the RSS 2.0 feed. You can leave a response, or trackback from your own site.